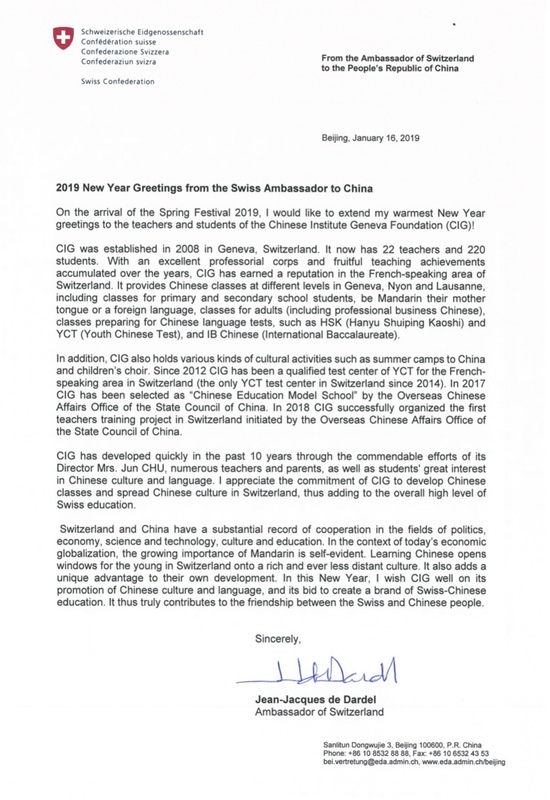 On the arrival of the Spring Festival 2019, I would like to extend my warmest New Year greetings to the teachers and students of the Chinese Institute Geneva Foundation (CIG)! CIG was established in 2008 in Geneva, Switzerland. It now has 22 teachers and 220 students. 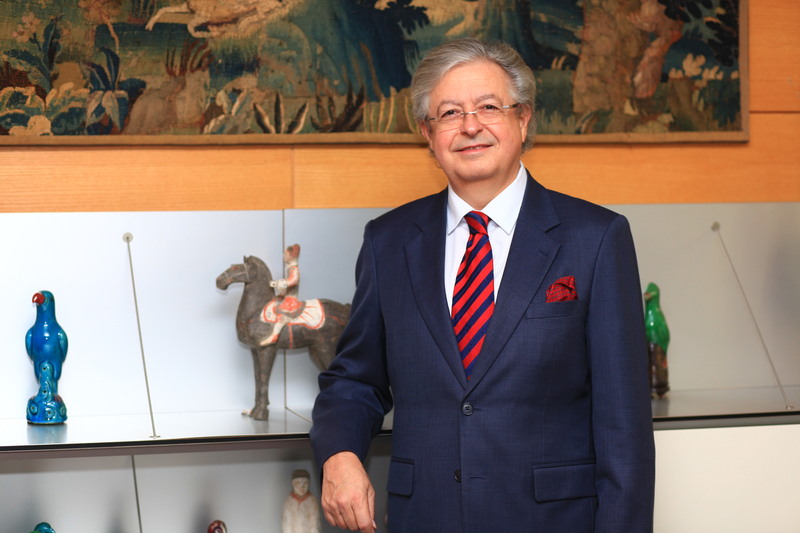 With an excellent professorial corps and fruitful teaching achievements accumulated over the years, CIG has earned a reputation in the French-speaking area of Switzerland. It provides Chinese classes at different levels in Geneva, Nyon and Lausanne, including classes for primary and secondary school students, be Mandarin their mother tongue or a foreign language, classes for adults (including professional business Chinese), classes preparing for Chinese language tests, such as HSK (Hanyu Shuiping Kaoshi) and YCT (Youth Chinese Test), and IB Chinese (International Baccalaureate). In addition, CIG also holds various kinds of cultural activities such as summer camps to China and children’s choir. Since 2012 CIG has been a qualified test center of YCT for the French-speaking area in Switzerland (the only YCT test center in Switzerland since 2014). In 2017 CIG has been selected as “Chinese Education Model School” by the Overseas Chinese Affairs Office of the State Council of China. In 2018 CIG successfully organized the first teachers training project in Switzerland initiated by the Overseas Chinese Affairs Office of the State Council of China. CIG has developed quickly in the past 10 years through the commendable efforts of its Director Mrs. Jun CHU, numerous teachers and parents, as well as students' great interest in Chinese culture and language. 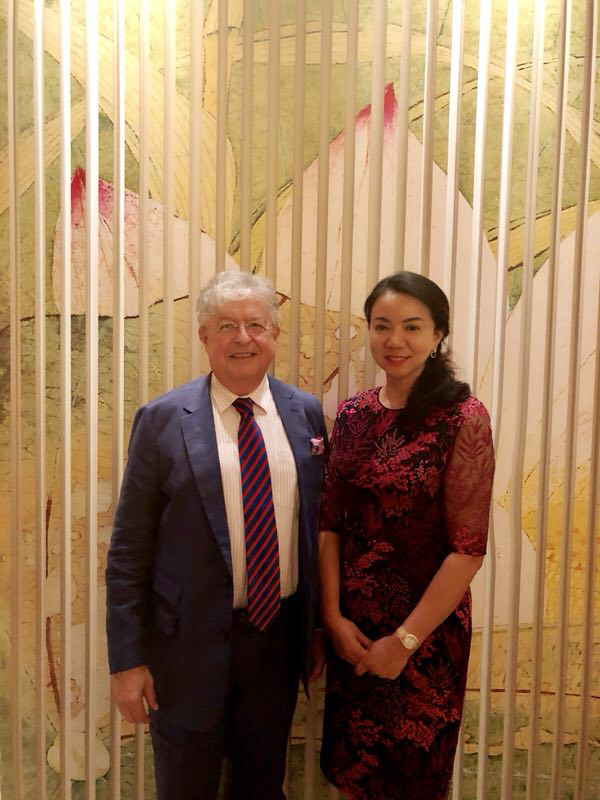 I appreciate the commitment of CIG to develop Chinese classes and spread Chinese culture in Switzerland, thus adding to the overall high level of Swiss education. 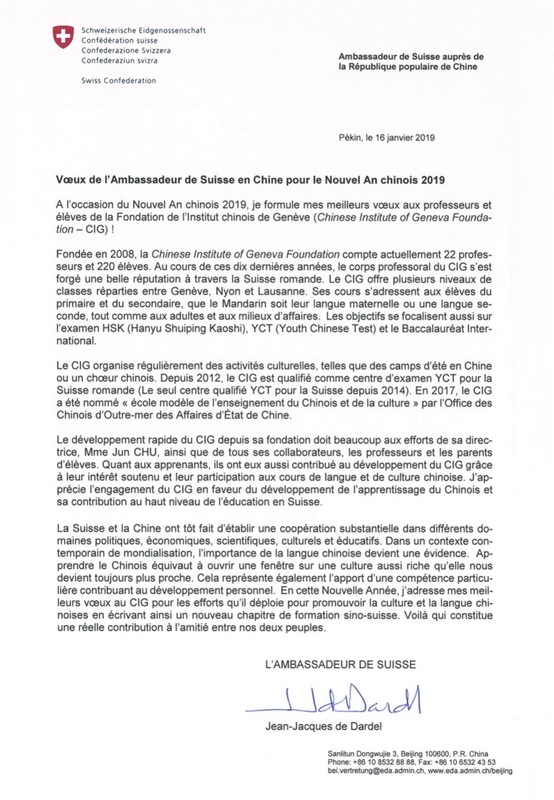 Switzerland and China have a substantial record of cooperation in the fields of politics, economy, science and technology, culture and education. In the context of today’s economic globalization, the growing importance of Mandarin is self-evident. Learning Chinese opens windows for the young in Switzerland onto a rich and ever less distant culture. It also adds a unique advantage to their own development. In this New Year, I wish CIG well on its promotion of Chinese culture and language, and its bid to create a brand of Swiss-Chinese education. It thus truly contributes to the friendship between the Swiss and Chinese people.